The so-called Maison Carrée or “square house” is an ancient Roman temple located in Nîmes in southern France. 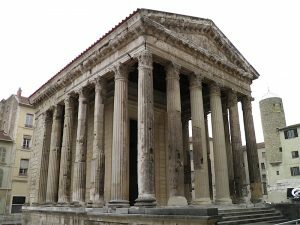 Nîmes was founded as a Roman colony (Colonia Nemausus) during the first century B.C.E. 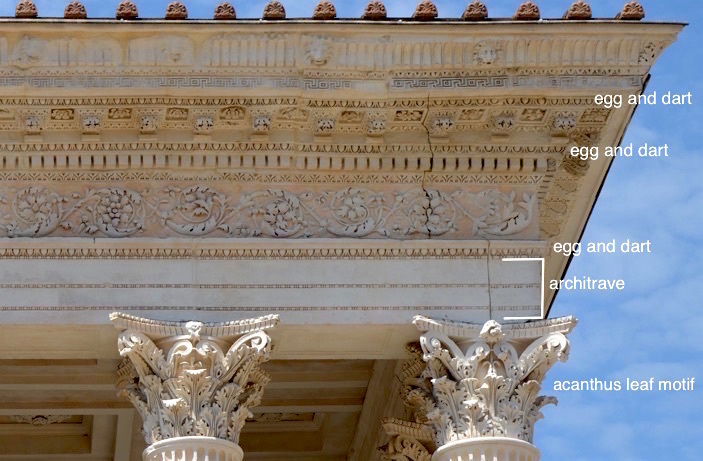 The Maison Carrée is an extremely well preserved ancient Roman building and represents a nearly textbook example of a Roman temple as described by the architectural writer Vitruvius. 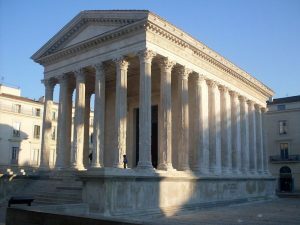 The frontal temple is a classic example of the Tuscan style temple as described by Vitruvius (who wrote On Architecture in the first century B.C.E.). This means that the building has a single cella (cult room), a deep porch, a frontal, axial orientation, and sits atop a high podium. 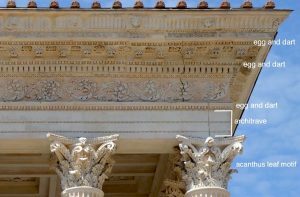 The podium of the Maison Carrée rises to a height of 2.85 meters; the footprint of the temple measures 26.42 by 13.54 meters at the base. The building is executed in the Corinthian order (easily identified by the acanthus leaf motifs on the capital) and is hexastyle in its plan (meaning it has six columns across the façade); twenty engaged columns line the flanks, yielding a pseudoperipteral arrangement (the front columns are free-standing but the columns on the sides and back are engaged, that is, attached to the wall). The temple has a very deep pronaos (porch). The superstructure is decorated with egg-and-dart motifs, with the architrave divided into three zones. The deep porch which puts an emphasis on the temple front and the pseudoperipteral arrangement clearly differentiate this from an ancient Greek temple. The temple once carried a dedicatory inscription that was removed in the Middle Ages. Following the reconstruction of the inscription in 1758, scholars believe that the dedication of the building honored Augustus’ grandsons and intended heirs, Caius and Lucius Caesar. The dedicatory inscription read, in translation, “To Gaius Caesar, son of Augustus, Consul; to Lucius Caesar, son of Augustus, Consul designate; to the princes of youth” (CIL XII, 3156). While not especially common within Italy during the time of the Iulio-Claudians, the worship of the emperor and the imperial family was more commonplace in the provinces of the Roman empire. The late first century B.C.E. Temple of Augustus and Livia in located in Vienne, France (an ancient settlement of the Allobroges that received a Roman colony) is very similar in plan to the Maison Carrée. This temple was originally dedicated to Augustus alone, but in 41 C.E. the emperor Claudius re-dedicated the building to include Livia, his grandmother (and the wife of Augustus). Taken together these temples show us not only well preserved examples of early Imperial architecture but they also show the degree to which local elites would invest in monumental construction in order to celebrate the emperor and his family members. Just as honorific temples at Rome were sponsored by elites, construction in the provinces also often relied on elite members of the community to fill the role of artistic patron. Robert Amy, “L’inscription de la maison carrée de Nîmes”, Comptes rendus des séances de l’Académie des Inscriptions et Belles-Lettres 114.4 (1970) pp. 670-686. Robert Amy and Pierre Gros, La Maison Carrée de Nîmes (Supplementa à “Gallia”; 38) (Paris: Éditions du Centre national de la recherche scientifique, 1979). James C. Anderson, jr., Roman Architecture in Provence (Cambridge & New York: Cambridge University Press, 2013). Jean-Charles Balty, Études sur la Maison Carrée de Nimes. (Bruxelles-Berchem, Latomus, revue d’études latines, 1960). Pierre Gros, “L’augusteum de Nîmes”, Revue archéologique de Narbonnaise 17.1 (1984) pp. 123-134. Pierre Gros, L’architecture romaine : du début du IIIe siècle av. J.-C. à la fin du Haut-Empire. 1, Les monuments publics (Paris: Picard, 2001). 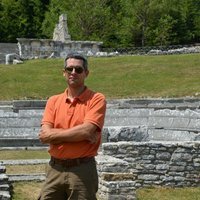 John Bryan Ward-Perkins, “From Republic to Empire: Reflections on the Early Provincial Architecture of the Roman West”, The Journal of Roman Studies, 60 (1970), pp. 1-19. 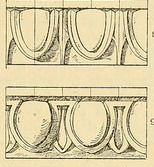 This entry was posted in Architecture, Art History, History, Roman, Rome. Bookmark the permalink.